Smart height-adjustable monitor arm with three joints, gas spring and cable management. The user-friendly design is intended for one monitor/screen. A practical and space-saving solution that fits most desks and screens. Can be adjusted with one hand and is easy to install on the table top with the included bracket. 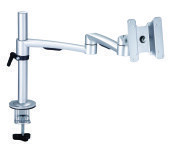 Ergonomic features: Gas Spring assisted arm helps easy adjustment for viewing comfort Increase viewing comfort and help reduce eye, back and neck strain Easy to mount on a desktop. Can be operated with one hand. Adjustable without tools. Height-adjustable Width-adjustable Mounting Standards: VESA , 100/75, (hole pattern: 100 x 100 mm & 75 x 75 mm) Weight Capacity: 1~8 kg.